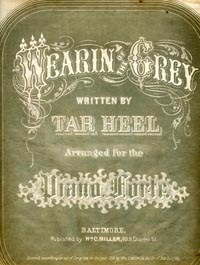 A piece of sheet music, Wearin’ of the Grey, identified as “Written by Tar Heel” and published in Baltimore in 1866, is probably the earliest printed use of Tar Heel. The New York Tribune further differentiated among North Carolinians on Sept. 20, 1903, when it observed that “the men really like to work, which is all but incomprehensible to the true ‘tar heel’”. At home, however, the name was coming to be accepted with pride. In Pittsboro on Dec. 11, 1879, the Chatham Record informed its readers that Jesse Turner had been named to the Arkansas Supreme Court. The new justice was described as “a younger brother of our respected townsman, David Turner, Esq., and we are pleased to know that a fellow tar heel is thought so much of in the state of his adoption.” In Congress in 1878, Rep. David B. Vance, trying to persuade the government to pay one of his constituents, J.C. Clendenin, for building a road, described Clendenin in glowing phrases, concluding with: “He is an honest man…he is a tar heel.” In 1893, the students of The University of North Carolina founded a newspaper and christened it The Tar Heel. By the end of the century, Tar Heel – at least within the state – had been rehabilitated. John R. Hancock of Raleigh wrote Sen. Marion Butler on Jan. 20, 1899, to commend him for his efforts to obtain pensions for Confederate veterans. 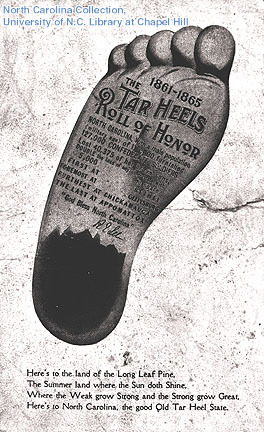 This is an action, Hancock wrote, “we Tar Heels, or a large majority of us, do most heartily commend.” And by 1912, it was a term of clear identification recognized outside the state. On August 26 of that year, The New York Evening Post identified Josephus Daniels and Thomas J.L. Pence as two Tar Heels holding important posts in Woodrow Wilson’s campaign. So there it was in 1922, the stamp of credibility on Tar Heel. Surely an august institution such as The New York Evening Post would never malign two gentlemen of the stature of Daniels and Pence, no matter how bitter the presidential election campaign. The badge of honor stuck, and, in a manner of speaking, North Carolina residents who have sat back on their heels ever since, happy to be Tar Heels. Who’d want to be a Sandlapper, anyway?